Operation Linebacker II was a U.S. Seventh Air Force and U.S. Navy Task Force 77 aerial bombardment campaign, conducted against targets in North Vietnam during the final period of the American commitment to the Vietnam War. The operation was conducted from 18 December to 29 December 1972 (hence its unofficial nickname - the "Christmas Bombings") and saw the largest heavy bomber strikes launched by the U.S. Air Force since the end of the Second World War. 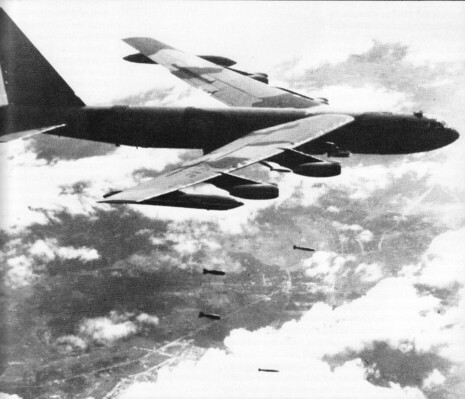 Linebacker II was a resumption of the Operation Linebacker bombings conducted from May to October, with the emphasis of the new campaign shifted to attacks by B-52 Stratofortress bombers rather than tactical fighter aircraft. Operation Linebacker II operations were initiated on 18 December 1972 and were directed by the Joint Chiefs of Staff (JCS) to continue until further notice. The primary objective of the bombing operation would be to force the North Vietnamese government to enter into purposeful negotiations concerning a cease-fire agreement. The operation employed air power to its maximum capabilities in an attempt to destroy all major target complexes such as radio stations, railroads, power plants, and airfields located in the Hanoi and Haiphong areas. Unlike previous bombing campaigns, Linebacker II provided the Air Force and U.S. Naval forces with specific objectives and removed many of the restrictions that had previously caused frustration within the Pentagon.